Ashley Zuelke is the International Trade Administration’s senior advisor for Export Policy, Promotion and Strategy. 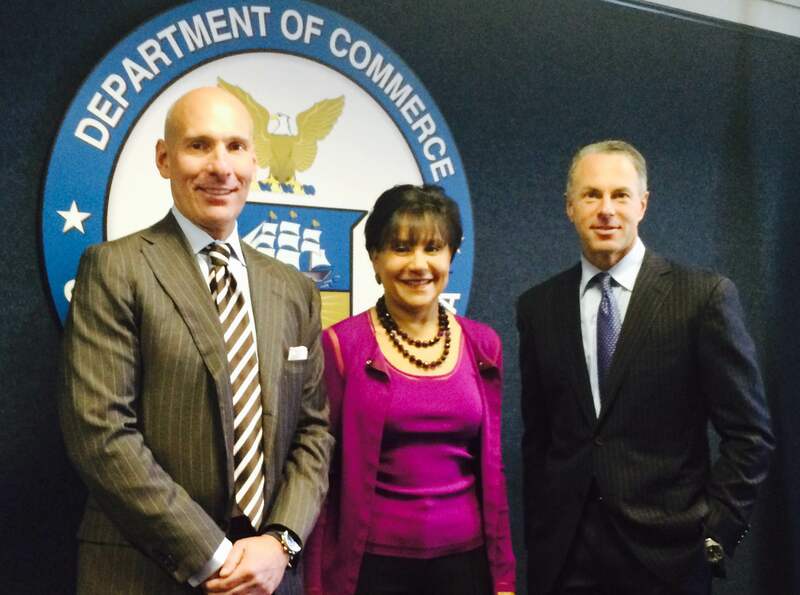 (Left to right) Under Secretary of Commerce for International Trade, Stefan Selig, Secretary of Commerce Penny Pritzker, and Devin Wenig, Chief Executive Officer of eBay at a “Listen and Learn” session. Recently, incoming eBay CEO Devin Wenig, eBay executives, and Department of Commerce leadership including Secretary Penny Pritzker and Under Secretary Stefan Selig hosted a first-of-its-kind “Listen and Learn” session with small businesses who are successfully making international sales online through eBay Marketplace. For policymakers, the session brought to life the experiences of technology-enabled exporters, and for participating businesses, it provided valuable insight into the scope of available U.S. government export resources and how to effectively use them. In many ways, the listen and learn session focused on access – both to global customers and to export assistance. Advances in technology have given U.S. small businesses unprecedented opportunity to have an online storefront facing the 96 percent of consumers outside the United States. Platforms like eBay, with seller and customer rating systems and payment facilitation tools, are helping small businesses overcome common challenges for exporters: meeting foreign buyers, building trust, and ensuring payment. While available federal government data shows that less than five percent of U.S. goods-producing companies export, eBay research on its sellers demonstrates that more than 90 percent of U.S. companies on the platform are selling to international customers. eBay sellers at the roundtable each shared the percentage of their sales that go to international customers, which ranged from 5 to 45 percent. Sellers detailed what factors into their decision to sell internationally. Providing excellent customer service is paramount, so steps in the export process that are unclear or uncertain provide the biggest roadblocks: pricing for the full cost of a shipment, ensuring shipments reach the customer and clears overseas customs agencies, and ensuring the necessary paperwork is complete. Many of the company challenges discussed are what prompted the President’s Export Council to make a recommendation to President Obama on how agencies can better serve technology-enabled exporters, leading to a key focus on responding to customer needs and modernizing U.S. export assistance in our national efforts to promote trade, the National Export Initiative/NEXT, launched in May 2014. Two of the 10 sellers participating were aware of U.S. government export assistance resources, pinpointing why building partnerships with e-commerce platforms like eBay is critical to the international success of small business exporters. Start by connecting with your local office in more than 100 offices across the country for business planning, verifying buyers and distributors, strategies for selling online, and troubleshooting. Local offices are the gateway to help from Commercial Service Officers in more than 75 markets, an opportunity that sellers navigating overseas customs procedures should not miss. The Small Business Administration has representatives in 20 of the domestic offices listed above, and both and the U.S. Export-Import Bank have financing and insurance products that can be right-sized for micro multinationals to expand production facilities, translate product literature, and insure against commercial and political risks. Participate in Discover Global Markets: E-Commerce Strategies for Exporters in Dallas/Fort Worth, TX October 8-9, 2015. This event, organized by the U.S. Commercial Service, will bring together industry leaders and U.S. commercial diplomats from over 20 countries to present e-commerce strategies to U.S exporters. For more information on international solutions and logistics, visit export.gov.